I am a palaeoecologist at the Open University. My research involves reconstructing how our planet has changed over longer time scales in the past (1-2 million years). At first glance my research does not seem entirely relevant to current climate change but in fact it is integral. The climate system is hugely complicated and we still don’t fully understand how all the aspects work or how they interact together. One way of learning how the system operates is to simply observe it. The longer you observe it; then the better you will understand how it works and what are the possibilities for how it may change. My talk at the Science Matters event was intended as a short foray into the life of environmental scientists, it was full of many nice pictures and funny tales of my experiences on remote fieldwork. But fundamentally I hoped to try and bridge the gap between the past and future. You can watch the talk below and read my abstract below that. The video is just over ten minutes long. In my talk I hoped to show the students how we learn about our earth and demonstrate to them the link between scientific questions, data collection and the outcomes. If we want to predict the range of possibilities for our planet then we need to know the range of possibilities that occurred in the past. It may not give us absolute answers as to what lies ahead but having a small number of possibilities is a lot more useful than an infinite amount. Our planet is very different from place to place; we have hot environments, cold environments, wet, dry, windy, even calm environments. But not only is it different from place to place it has also been very different back in time. The environment outside our windows has not always been like it is now. The deserts were not always deserts and the Polar Regions were not always icy and cold. 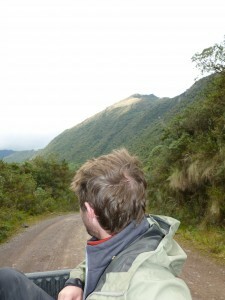 Frazer is a Palaeoecologist; he studies how environments change on long timescales. He is interested in how our planet has come to be the way it is and how that might give us clues as to what it will be like in the future. 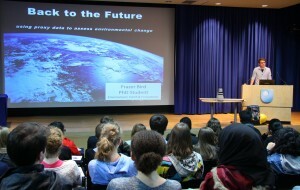 In his talk Frazer provided an insight in to Earth’s recent history. Humans haven’t been here very long and so we can’t rely on old books to learn about earth history. Instead, we have to learn to read the clues that are left behind. In other words, scientists look for evidence by proxy. In his talk Frazer explained how he is trying to do this in the South American Andes mountains. Climate change and global warming has moved from being a relatively new scientific discovery to one that has become cemented in all forms of public discourse. Newspapers and television programmes regularly report on the possible links between climate change and abnormal weather; our politicians debate action plans at the international level and school children learn about the fundamental theories behind the science. It is very hard to think of any other area of scientific endeavour of which non-scientist are as aware off. Yet despite a broad knowledge of the issue there can be a gap between current research and public debate. Often interpretations of the scientific output can be misleading and in some cases lead to controversies in the public sphere where none such exist in the scientific community (for example, see Holliman, 2012). This can be particularly a problem with regards to climate models and their predictions for the future. The truth is as scientist we work a lot on uncertainties and often there is no absolute answer to a question. If you are not familiar with this as a concept it can be quite alien. Some may even think whilst the scientist has a range of possible answers then they don’t truly understand what is going on and therefore we should disregard all conclusions. This isn’t how environmental science works; sometimes the absolute answer isn’t important. It’s about asking the right questions and studying them methodically. I feel if more was known about the realities of how scientists work, and as to how we arrived at a given set of uncertainties, then perhaps more trust would be placed in the science overall. Although my research is on past climate change ultimately what we learn and the results we generate feed directly into modern day climate science and future forecasting. By learning more about the past it helps us to observe the climate system for a longer period and so understand it in more depth. The world is 4.5 billion years old and it has changed a lot over that time. The climate change we are currently experiencing is just one of many. The more we learn about how the change happened over those billions of years then we can begin to narrow down the range of possibilities for our future. This entry was posted in Events, Presentations, School-University Engagement and tagged CEPSAR, culture change, Denbigh school, Engaging opportunities, engaging with school students, lecture, postgraduate research, Public engagement with research, RCUK, SUPI, Web video on Tuesday, 14 January 2014 by Frazer Bird.